I’m sure all of us have that favorite anime series where we would like to see our favorite characters one last time. Unfortunately for fans of Rurouni Kenshin, they were stuck with the Seisou-hen OVA, the cheap cop-out for animating the manga’s Jinchuu arc. As much as I love Rurouni Kenshin, Super Dimension Fortress Macross found its place next to Rurouni Kenshin as one of my all time favorite anime series. As I said in that review, it is rare that I feel as emotionally invested in an anime series as I did with Macross. I happened to find the Flashback 2012 OVA, and decided to check it out. I need to warn that this is a title that I find tough to review. The reason that is so is because Flashback 2012 is a 30-minute-long music video where you get to see scenes of Macross as well as from the movie Do You Remember Love? set to popular songs Iijima Mari sang in her role as Lynn Minmay. With that in mind, there is a pretty minimal amount of new footage. The context of the OVA is Minmay delivering a farewell concert before she joins Hikaru and Misa as they take off in the SDF-2 Megaroad, the seed ship that is meant to expand humanity’s new frontier. As Minmay sings, she reflects on the events that led up to that point. Ultimately, this OVA really is only for die-hard Macross fans. It relies solely on the nostalgia factor that seeing images of the show and movie and hearing Minmay songs would bring about. In that sense, it is kind of the opposite of Macross Plus, which only barely made a reference to Minmay while pretty much forgetting about the other major characters from the series. Thus, it wouldn’t be accurate to say Flashback 2012 is a sequel of any sort. As I very much did love the original Macross series, I will be pretty generous with scoring this OVA. It did what it sought out to do, which was let me see my favorite characters from Macross while having me listen to my favorite Lynn Minmay/Iijima Mari songs. Other than that, there really is no reason for this to exist, but it was a much better sendoff than Rurouni Kenshin: Seisou-hen was. NOTE: This OVA was not made in 2012. 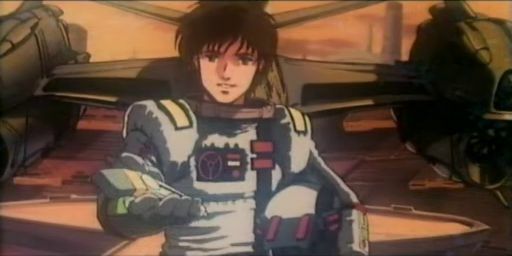 The year 2012 is a reference to the year the series, which was made in 1982, takes place. The OVA was actually made very soon after the Do You Remember Love? movie, which itself was made very shortly after the series was finished airing.